Coming up this Monday Night - October 1st - Bridgewater Academy Lions Semi-Annual DINING FOR A CAUSE (Mass. 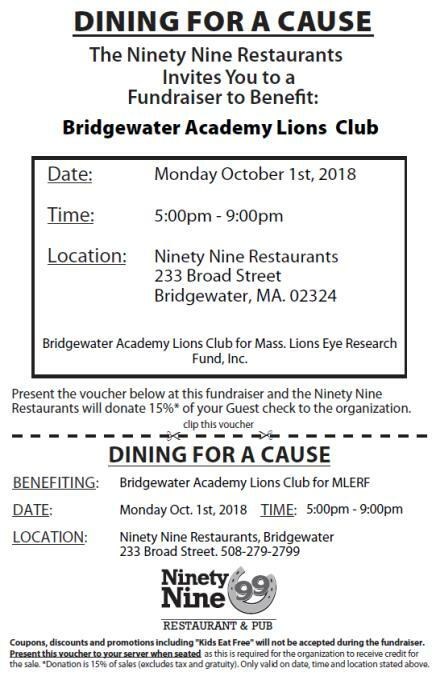 Lions Eye Research Fund, Inc.) at the Bridgewater 99 Restaurant, Campus Plaza. Print out this flyer. Bring with you that night between 5 pm and 9 pm, and give to your server. Then 15% of your guest check (excluding tax and gratuity) will be sent by the 99 parent company directly to Mass. Lions Eye Research Fund, Inc. at no added cost to you. The flyer is valid for Dine-In or Take-Out. Bridgewater Academy Lions will have prize drawings in the foyer. Take a chance on a wire pumpkin/candle centerpiece, harvest blessings sign, haircut & style certificate from Polished Image Salon, Dog Treats & More basket from Woofy Biscuits, pumpkin shape wine glasses, Stonewall kitchen products basket, and Himalayan salt lamp. Prize ticket proceeds to benefit our local scholarships, community programs, and other BALC charities.